Organized by the Global Initiative for Chronic Obstructive Lung Disease (GOLD), World Chronic Obstructive Pulmonary Disease (COPD) Day takes place on 17th November, which aims to raise public awareness of COPD. 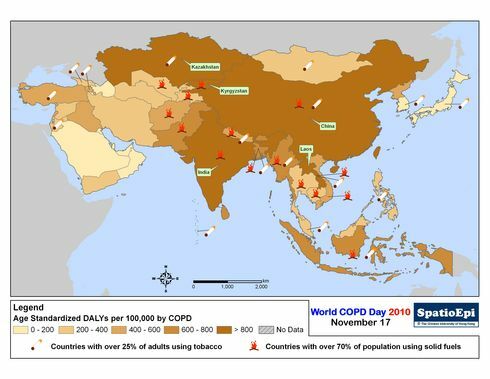 In Asia, COPD causes premature deaths and avoidable disabilities. The map shows the estimated burden of COPD in 2004, expressed as age standardized disability-adjusted life year (DALY). As depicted by graduated colours, population in Kyrgyzstan, Laos, Kazakhstan, India and China are losing the greatest number of life years as a result of COPD. The cigarette and fire symbols indicate countries with a high prevalence of tobacco use in adults and the use of solid fuels respectively. Cigarette smoking and extensive use of solid fuels have been shown to be associated with the heavy burden of COPD. Chronic obstructive pulmonary disease (COPD) is a collective term for chronic and progressively deteriorating lung diseases characterized by limitations in lung airflow. Common symptoms of COPD include breathlessness, excessive sputum production and chronic cough. Smoking and exposure to air pollution and occupational dusts and chemicals are known risk factors. COPD is incurable but supportive treatment may help slow its progression. Spirometry and X-ray are simple procedures for COPD diagnosis.